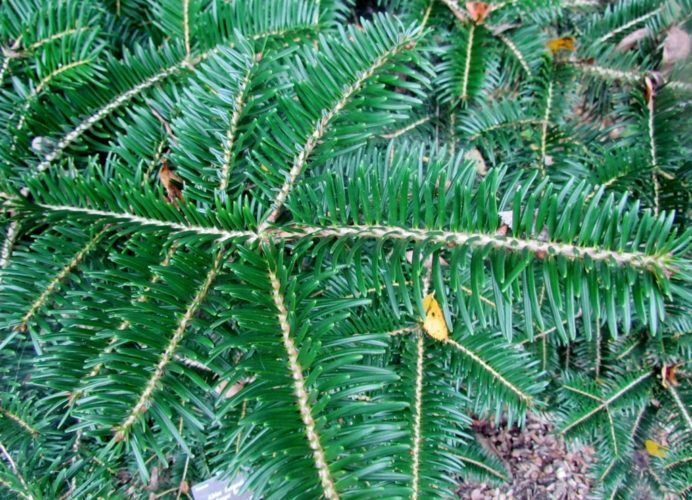 Abies fargesii, first described in 1899 by Adrien René Franchet (1834–1900), is commonly known as Farges fir in the English language and as 巴山冷杉 (bashan lengshan) in Chinese. Franchet named it after the French missionary, botanist and plant collector, Paul Guillaume Farges. It should be noted that the closely-related A. fanjingshanensis may also prove to be a variety of A. fargesii. Abies fargesii var. fargesii, the typical variety which is described here. Description. 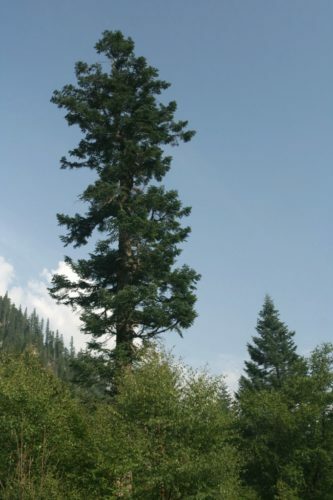 Farges fir is an evergreen coniferous species of tree which will grow to a mature height of 130 feet (40 m) tall with a 60 to 80 inch (150 - 200 cm) diameter at breast height, with a cylindrical trunk. First-order branches are massive, short, and sparse. Second-order branches spreading, assurgent, or pendant below. Its crown is narrowly-pyramidal or conical in structure. Bark is smooth, gray, and finely-flaky on young trees, becoming gray-brown, scaly, and fissured on older trees. Branchlets are smooth, shallowly grooved, and slightly pubescent within the grooves and are reddish brown, purplish or 'mahogany' (variable) in color. Vegetative buds are ovoid to broadly obtuse, 0.24 to 0.3 inch (6 - 8 mm) long and 0.16 to 0.2 inch (4-5 mm) wide, slightly resinous and purple-red. Bud scales are triangular-ovate and yellowish-brown in color, persisting for several years. Leaves are spirally arranged, crowded in several overlapping ranks of unequal length. The lower leaves are spiny and held upright on coning shoots, 0.4 to 1.8 inches (1 - 4.5) cm long by 0.08 to 0.14 inch (2 - 3.5 mm) wide, twisted at the base, stomata below in two bands divided by a midrib; shining green above, whitish- or glaucous-green below. Pollen cones are yellow with red microsporophylls, cylindrical, 0.5 inch (13 mm) long by 0.2 inch (5 mm) wide, crowded and axillary near the shoot apex. Female cones are bluish-purple, maturing to purplish- or reddish-brown, ovoid-oblong or broadly cylindric, 2 to 3.5 inches (5 - 9 cm) long by 1.2 to 1.6 inches (3 - 4 cm) broad with very short peduncles. Seeds are oblong, black, ca. 0.2 inch (5 - 6 mm) by 0.13 inch (3-3.5 mm), to 0.6 inch (15 mm long) with the black, cuneate, oblique wing. Distribution. This species is native to central China — Gansu, Henan, Hubei, Shaanxi, and Sichuan provinces. It grows in mountains and river basins at altitudes between 5,000 and 12,800 feet (1,500 – 3,900 m). 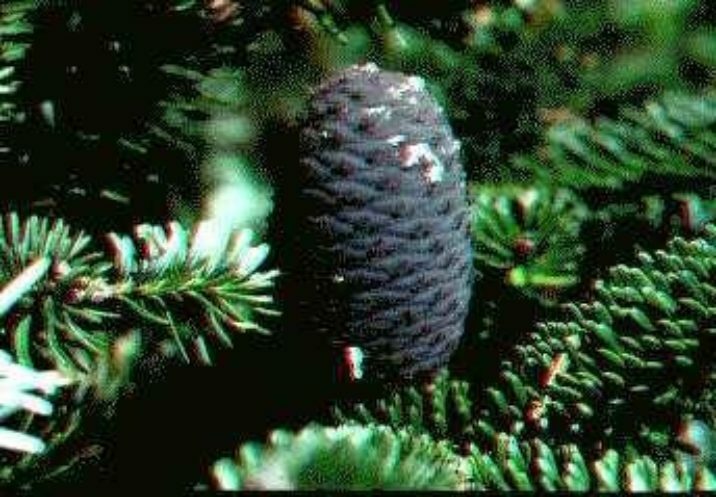 Abies fargesii is a timber tree used in construction and for pulp. Abies fargesii — a tree growing in habitat, Jiuzhaigou Valley, Sichuan, China, 2650m altitude. Abies fargesii — a closeup of cones and needles. 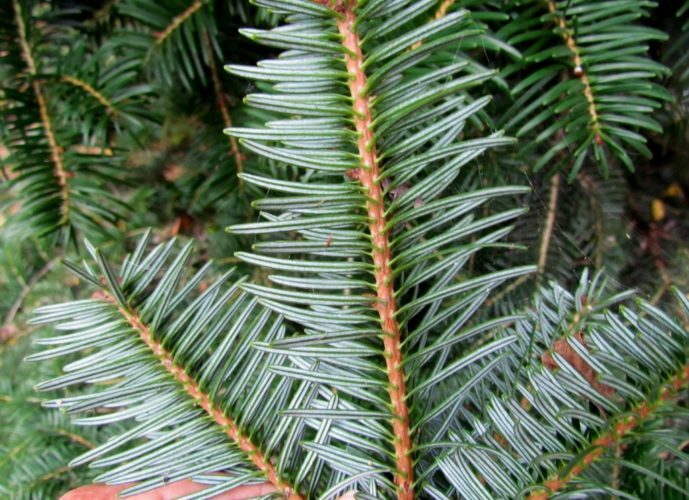 Abies fargesii — closeup of foliage (underside), JC Raulston Arboretum, University of North Carolina, Raleigh. Abies fargesii — closeup of foliage, JC Raulston Arboretum, University of North Carolina, Raleigh. 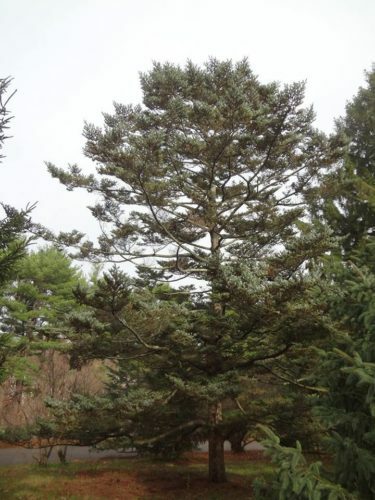 Abies fargesii at Arnold Arboretum, Boston, Massachusetts. This tree was grown from wild-collected Chinese seed from E.H. Wilson in 1911.